A: Man’s chief end is to glorify God and to enjoy Him forever. This past Sunday morning, I was listening to my “Not Just Sunday” station on Pandora, and reading through the Westminster Shorter Catechism. Yes, I may be a little bit of a nerd, but it’s good stuff. Really! Anyway, I kept coming back to the very first question in the Catechism. It grabbed my attention and made me ask, “Do I glorify God in the things I say and do?” I try to, as, I suspect, do you. But do I enjoy Him? I thought over this word, “enjoy”. What does it mean? I enjoy ice cream. I enjoy driving on a warm Summer evening with the windows down and the music loud. I enjoy looking into an ink black sky on a crisp Fall night, tracing the pictures God painted in the stars. I enjoy time spent with my parents and old friends whenever I get to go home. I enjoy roller coasters and Tilt-A-Whirls (especially with my dad!). But do I enjoy God? This is, in all honesty, a foreign concept to me. Most of my life, I feared God, and not in the biblical way. I was afraid of Him. And how can you enjoy something that terrifies you? I read through the proof texts of this clause “to enjoy Him forever”. “I keep my eyes always on the Lord…therefore my heart is glad” (Psalm 16:8-9). “The Lord Himself is my strength and my song” (Isaiah 12:2). “Rejoice in the Lord always” (Philippians 4:4). Yes, the principle is there. The idea of enjoying God is 100% biblical. I thought again about things I enjoy, and I focused on how I feel when I get to experience them: I smile. I laugh. I feel a sense of excitement in anticipation of them. I am satisfied and content in the midst of them. Yes, this is exactly how I want to feel about my time with God. I want to smile and laugh with Him. I want to feel a sense of excitement when I get to spend quality time with Him. And I want to be satisfied and content, having been with Him. To glorify God, I must simply think before I speak and act. “Is what I’m about to do or say going to bring Him glory?” But enjoyment is much more abstract. It is not something that can be so easily and simply done. It is not something that can be enforced. It is a gift, and one that God wants so desperately to give us. And so I pray, Oh God, turn my heart toward You so that I find my satisfaction, my contentment, my joy and my happiness in You today. When I left for church on Sunday morning, my fear was that I would be shunned for being away for so long (what am I, Amish? Come on! ), that I would have to justify my absence, that I would be made to feel guilty for not meeting for corporate worship, in spite of the fact that what I really needed was some one-on-one time with God. What I found instead was an outpouring of love I could never have scripted, an answer to a question that has plagued me, and an unexpected word spoken straight to a very deep longing in my heart – twice. Eight years ago, I packed my belongings, hugged my family and friends good bye, and moved to a new state several hours away. At the time, it seemed like the right thing to do, and all the details fell into place in ways only God could have orchestrated. Since then, I have experienced intense loneliness and isolation as each good friend I’ve made here has eventually moved away. I lost the job I moved here to take, spent almost two years unemployed, and the remaining two chronically underemployed. I spent a week in the hospital, I’ve had two car accidents, the second of which might very well have killed me were it not for the grace of God and the kindness of strangers, and was diagnosed with a disease but denied treatment because I’m not quite sick enough. I’m one internship away from finishing my Master’s degree and getting a “real” job, but for the second semester in a row, I have failed to land one. So the fact that I am homesick, frustrated, discouraged and yes, a bit depressed is really not all that shocking. I’m ready to be done with this place that represents little more than pain, disappointment and failure; ready to find my Promised Land. But God has not seen fit to move me. Doors leading out of this place are closed, locked and barred. While a number of people up here know about most of my 8-year saga, I’m not sure any of them know how alone I really feel. I’ve never told anyone here about my fear that if I died on Saturday night, no one would even miss me until sometime Tuesday or Wednesday when I didn’t show up for work. I’ve never told anyone here that I’m afraid my car will break down somewhere because I have no one to call. I’ve never told anyone here that the reason I only go away for a few nights at a time is because I don’t know anyone well enough to ask them to take care of my cat if I go away for a week without feeling guilty about it. I’ve kept these things to myself (well, until now, I guess) because I don’t want anyone to feel obligated to help me. I don’t want to burden anyone with my comparatively insignificant (and potentially inconvenient) needs. And I haven’t told anyone because being single and alone is embarrassing. I would much rather hold up the “everything’s fine” mask than let an acquaintance know that I have an unmet need. I know this is, at least in part, a pride thing. God and I are going to work on that. But it’s also that I think I am perfectly capable of looking out for myself because I’ve done so for so long, and there are others out there with needs more legitimate than mine. I’m the helper, not the helpee. Until now. Two months after the accident, I still have some body parts that hurt and that make completing certain tasks painful. Somewhere in front of my house, there is a lawn. I say “somewhere” because at the moment, I can’t see it thanks to all the leaves and sticks covering it from the swipe my area took from Hurricane Sandy. I look at that collection of storm debris everyday and wonder how I can get rid of it without hurting myself. In an uncharacteristic move, I mentioned this to the woman who was my small group leader at church for 3 years (also, the same woman who sat with me on Sunday). Even though I really should know better by now, her response floored me. Through these two beautiful women, God silenced my strongest argument for wanting to move back home. In these two unexpected words, He calmed my long-held fear and restored some hope to my sick heart. Whether my leaves actually get done or not is unimportant. Whether I ultimately end up moving away after all is unimportant. What’s important is that in a moment of fear, God spoke peace and encouragement to my heart, and flooded it with joy. And if I hadn’t gone to church, I would have missed the joy of obedience. When has God spoken a word directly to your fear? What follows is Chapter 3 of a five-part story stemming from just an hour and a half of time spent with God’s people, in God’s house, in response to God’s direction. My sin doesn’t grieve me. I want it to. I think that if it does, that means I’m living a more holy life. But I find in reality, I can do something on Saturday I know is wrong, and then have an incredible time of worship with God on Sunday morning, only to think of it later. For a long time, I hated this, and I asked God to convict me so that I feel horrible when I sin. I argued that if I didn’t feel convicted of my sin, I was taking the Cross for granted. I argued that if I sin, I should be separated from God until I fall on my face and cry out to Him for mercy and grace and forgiveness. When a Christian sins, she should feel absolutely devastated that she failed to live up to God’s standard. She should weep and mourn over her sin, and be so grieved in spirit that she cannot function until she has laid her sin before God and claimed His forgiveness. She should spend some time feeling unworthy in the shadow of the Cross before she gets up out of the dirt and promises to honor Christ’s sacrifice for her a little bit better tomorrow. When a Christian sins, she shouldn’t worry about it. After all, Christ died once for all, and God has removed our sin as far as the East is from the West. Once an individual has asked God to forgive her of all her sins, and has claimed that forgiveness, she’s good to go. Yes, she understands she will still fail to meet God’s standards from time to time, but she is already forgiven, so there is no need for weeping, sackcloth and ashes every time she gives in to temptation. She’s forgiven. That’s all there is to it. Within that broad spectrum, somewhere, is the truth. And then I had a light bulb moment. The reason I was so set on feeling convicted of sin is because my focus was in the wrong place. Yes, sin is bad. Yes, I am responsible for my actions, and yes, when I sin, I should confess it to God and claim His forgiveness again. And I will need to do that almost daily. But I wonder if maybe the reason I don’t feel the need to wallow in the dirt when I sin is found in verse 8. It is the Lord who fights the battle, not me. God knows I am human. He knows I will fail. And He already forgave me before I ever sinned. Maybe I don’t need to obsessively confess every sin, and spend hours asking God to reveal more sins to me. Maybe instead, I need to remember that the battle is won and that it was never mine to fight in the first place. This is by no means carte blanche to do whatever I want and never give it another thought because I’m already forgiven. But it frees me from the weight of my sin and the guilt that can so easily envelop, breeding even more sin. So here is where I have landed: Sin is a daily part of life. I hate it, but it’s there. God did not promise that when we accepted Christ as Lord and Savior of our lives we would stop sinning. He did promise, however, that when we confess our sin, He will forgive without reservation (1 John 1:9). If I am intently focused on feeling bad for my sin, I miss grace. If I feel free to sin without ever confessing, I take mercy for granted. I don’t need to feel guilty and convicted all the time, because if I do, there is no room for the joy of salvation. If there’s something in my life that God wants to work on, I am open to that. If I know I’ve just messed up, I will confess, thank God for His forgiveness and move on. What I won’t do is allow Satan to make me feel guilty for not feeling guilty. When I got to church on Sunday morning, one of the first songs we sang was taken right out of Psalm 24:3. “Give us clean hands. Give us pure hearts. Let us not lift our souls to another.” My pastor taught out of John 7:53-8:11 where the woman is caught in adultery, and Jesus, rather than convicting her, tells her to “go and sin no more”. That is no coincidence. That is the joy of obedience. If I hadn’t gone to church, I might still be weighed down in my search for this piece of truth. Instead, I am free. “Where the Spirit of the Lord is, there is freedom.” (2 Corinthians 3:17b, ESV) God just makes me smile sometimes! In what ways have you experienced the freedom that comes from forgiveness? What follows is Chapter 2 of a five-part story stemming from just an hour and a half of time spent with God’s people, in God’s house, in response to God’s direction. Dressed and in the car on my way to church, I felt a familiar fear welling up inside me. One of the things I hate more than anything else in the world, is having to sit by myself in church. It’s one of a few times in life that my singleness hurts the most. Sitting in church by myself is a reminder that I am on my own. As an extreme introvert, who also struggles with shyness stemming from an expectation of rejection, that hour and a half are pure torture if I have no one to sit with. With three services, there’s never a guarantee that someone I know well enough will show up. Yes, it’s probably a pride issue that God and I need to deal with, but at the moment, it can make church a very painful place to be. As I drove to church, I might have mentioned this to God. Again. Several times. I had taken a step of obedience when I left my comfy chair, got dressed and left the house. And I was afraid I would regret it. So I asked God for a few things: 1. Someone to sit with (obviously), 2. A tangible reminder that He loves me, and 3. That I would experience the joy that comes from obeying God’s direction. I was fully prepared to go 0/3, because after all, church isn’t about me and who I do or do not sit with. Church is about God, worshipping God, and spending time with God. When I focus on the fact that I’m sitting in the pew by myself, with space on either side of me, my focus is in the wrong place, and I feel guilty about that (more on guilt at a later date). It’s a difficult place to be where you’ve prayed but experienced more disappointment than joy. The Bible says, “Hope deferred makes the heart sick, but a desire fulfilled is a tree of life” (Proverbs 13:12). Even in my most honest moments, I see more disappointment in my past than desires fulfilled. So I have gotten in the habit of giving God an “out” when I pray for something specific. That morning, as I asked for those three specific things on my way to church, I again gave God an “out” in reminding myself that church isn’t about me. But when I think about it, I think that maybe all I did was paint a perfect picture of James 1:6. My “out” was really my doubt. But God, in His mercy, answered all three of those prayers with a resounding “Yes, Yes, Yes!” Someone who loves me (and who I love back) left her seat specifically to sit with me. I got my fill of hugs from people who were genuinely happy to see me, and who told me specific things they had been praying for me. And I got confirmation of a truth with which I had been wrestling just an hour earlier (more on that later, too). I drove into my church parking lot with more fear than faith. But because I obeyed when God said “Go”, I left with joy in my heart and thanksgiving on my lips. Obedience can be hard. It can take us from a comfortable place and dump us in a harsh environment. It can be counterintuitive. It can be painful, scary and dangerous. But disobedience is so much worse. Disobedience more often than not results in unpleasant consequences. But obedience? Obedience brings joy, peace and fulfillment. Obedience is never the wrong choice. When was the last time you experienced the joy of obedience? What follows is Chapter 1 of a five-part story stemming from just an hour and a half of time spent with God’s people, in God’s house, in response to God’s direction. This past Sunday morning, I was answering some questions in a devotional book I’ve been re-reading. Actually, I was answering one question, because that’s about as far as I got, and I didn’t even get to finish. The question was this: “Has the pain of your past ever made it hard for you to believe God’s promises and plans for your future? What do you sense He wants to change in your perspective?” (A Confident Heart, Renee Swope, © 2011). The answer I started to write was the equivalent of calling God out. I started to talk about recent prayers for direction that have been met with silence. I talked about how I only want to be where God wants me to be. About how I want to do something with my life that makes a difference in the world, but that all of my recent attempts to do so have been met with closed doors. Now let me stop to explain. Since the accident that very easily could have ended my life, I’ve been to church just once or twice. It’s not because I was mad at God or anything like that. It was actually quite the opposite. It’s such sweet time, the time I take to mull over God’s words, handed down from generation to generation. I can wrestle with those areas where my life experience and God’s Word do not seem to match. I can praise Him for new insight, and even more for gentle reminders of truths long forgotten. Then, I can respond. Not in a hurried, “that’s great, I’ll have to remember that later” kind of way, but in a “how is this going to change my thoughts, behaviors and attitudes in the next 24 hours” kind of way. It’s God and me, locked in a conversation filled with give-and-take, tears and yes, laughter. No obligations. No schedules. No need to get dressed and drive 35 minutes to church. Just God and me, enjoying each other’s company. For that season of my life, it was exactly what I needed. It was like a weekly retreat. The kind where you take your Bible and go out into the woods for a few days, but in my own living room for a few hours every Sunday morning. I worshipped so deeply and fully in those Sunday morning hours. It was what my soul had been craving for a long time. But that time was up. I saw it coming, and I was ready for it. I knew that at some point in the next few weeks, it would be time to go back to Sunday morning as I’ve known it my entire life. So that morning, when God said “Go”, I went. Have you ever taken time to retreat with God? How did it change your relationship with Him? What follows is a five-part story stemming from just an hour and a half of time spent with God’s people, in God’s house, in response to God’s direction. I got out of work that August Saturday afternoon and hopped in the car to head south to my parents house, like I have a hundred times before. It was sunny and warm, I had my Driving Mix CD playing nice and loud and I was making great time. As I drove down a stretch of road I have travelled more times than I can count, my rear view mirror was suddenly filled with a black car riding so close to my bumper, I could only see the tops of the headlights. He had come flying up behind me from out of nowhere. I had just finished passing a slower-moving car in the lane next to me, and there was one more I wanted to pass so I could get out of the fast lane. Without warning, the car behind me was now next to me, intent on cutting between me and the car I was about to pass. He came back into my lane just a split second too soon, clipping my front bumper just slightly. But it was enough. I lost control of the car, swerving between two lanes. The concrete barrier raced toward me, and a loud bang told me I had hit it. When I opened my eyes, it took a moment for me to realize I wasn’t dead. But something wasn’t right. The sky was angled wrong, and my seatbelt was cutting into my chest and my right hip. The car had flipped and landed on the passenger side. I was stuck, hanging in midair, held in place only by my locked seat belt. There was blood on my left arm and my knees hurt. My left ear was ringing so badly I couldn’t hear out of it. I looked around the car, trying to figure out what had just happened. Then I wondered how I was going to get out. It was probably just a few seconds, but it felt like forever before I heard voices outside the car, and then a man looked down at me through my side widow. Then there were two men. Then three. One of them pulled the door open and held it up as I twisted my legs out of the driver’s side, released the seatbelt and dropped onto the passenger side door. I had the presence of mind to grab my phone and my purse then climbed up on the passenger headrest as best I could. The two men reached in, grabbed my arms and pulled me out of the car. They guided me down the road a bit and I saw smoke, and then a small flame coming from the engine block. The men put me down on the side of the road as cars continued to fly past. Two women came into view as one of the men jumped to the other side of the barrier so he could hold my head steady, just in case I had a neck or back injury. One of the women was a nurse and immediately began bandaging my arm, then talked to my parents on the phone, assuring them I was alive and directing them to the hospital. The other – the wife of a firefighter who was currently trying to put out the fire with the extinguisher he carried in his car – held my hands and talked to me while two of the men – EMTs, it turns out – checked me for broken bones and asked questions to assess me for brain injuries. She continued to hold my hands and keep me focused on her while the newly arrived ambulance crew put on a neck brace and strapped me to a backboard. A state trooper arrived and I was taken aback by his kindness as he asked questions about what had happened. I remember thanking these seven people over and over again as I was loaded into the ambulance, but to this day, I still wish I knew their names so I could write them proper thank you notes. At the hospital, after I had been thoroughly x-rayed, scanned, pricked and prodded, I was moved to the Trauma ER. The nurse let my parents come back to see me, but only because I was the only patient there. She told us that if someone else came in, they would have to leave. No one else came in. Not a single other patient came in to the trauma ER at an inner-city hospital on a Saturday night. 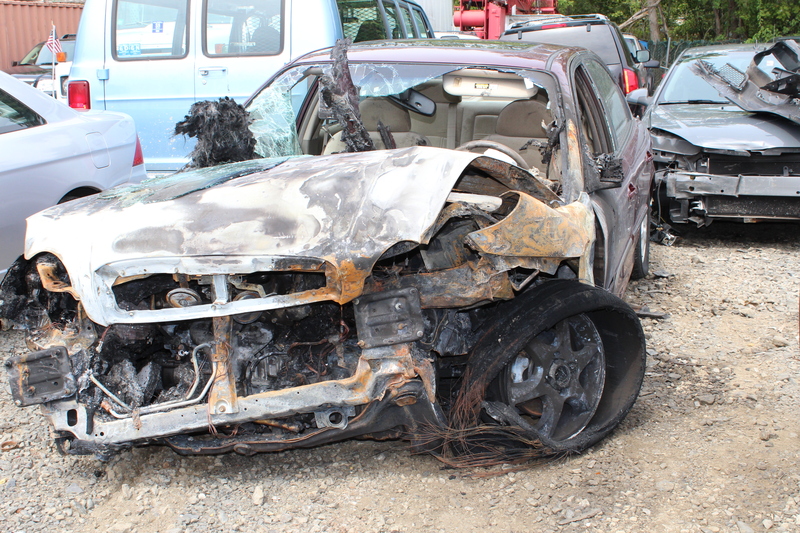 A few days later, my parents and I went to the junkyard to see if anything could be salvaged from my car. The clothes I had packed for the weekend were in there. My work badge. My Bible. The book I needed to study for my upcoming exam. Prescription sunglasses I had no money to replace. Just things, but important things. When we got our first look at the car, we all cried. Tears of fear for what could have been. Tears of shock at how badly damaged the car was. Tears of thankfulness to God for His protection, for sending those seven people, and for keeping the fire at bay long enough for me to get out. The fire breached the cabin, right where I had been hanging just moments earlier. Over and over again in those few hours of terror, God showed his faithfulness. God granted peace in the midst of chaos. Everywhere we looked, God. His love, His power, His mercy and His grace. His kindness worked through seven strangers. I’m in awe of what He did that day, but really, it’s not all that different from what He does in my life every day. And for that, I am forever thankful. When was the last time you saw God at work in the midst of chaos?